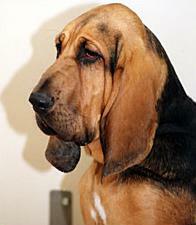 The Bloodhound is an ancient breed, first taken to England from Normandy by William the Conqueror. The name Bloodhound is not for being "blood thirsty", but from being a hound of pure blood (pure in breeding). They were bred from the Talbot hound and the St Hubert hound, but have been identified as the modern Bloodhound since the Middle Ages. The Bloodhound has the best nose of any hound and excels at tracking. It is first and foremost a scenting breed and will be persistent in following a trail, no matter for how long. It has been known for a Bloodhound to successfully follow a trail that was more than 72 hours "cold". 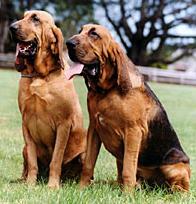 In America, Bloodhounds are used by the police for manhunts and have been successful in finding missing persons. The Bloodhound is a reserved and sensitive hound. They rely heavily on their scenting abilities, and would rather "smell" you first before introducing themselves, but once they get to know you they are affectionate. At home, they will let you know when you have visitors with their deep voice, but they are no guard dog. They will only "give voice" when there is a reason, they do not bark just to hear the sound of their own voice. The Bloodhound's characteristic wrinkles and large amount of loose skin can have its drawbacks, they do drool and dribble and will leave "snail trails" throughout the house. The Bloodhound is a "pack hound" and therefore must get on well with other animals. A Bloodhound does not like to live alone, and if his human companions have to spend time away at work or school, the Bloodhound will need a companion. They get on well with other animals. It is important that when introducing a small kitten, or puppy to a fully-grown Bloodhound, that you do it gradually. Although the Bloodhound is not aggressive towards other animals, its sheer size can cause problems. If allowed to grow up with other animals or be introduced as a puppy, Bloodhounds enjoy the company of other animals. Having a short coat, a Bloodhound is low maintenance. A good regular brushing is basically all that is required of the coat. The long ears can give problems with ear mites or fungal infections and need to be cleaned regularly. The ends of the ears should also be cleaned after meals. They do need regular exercise and they grow quickly in the first 12 months so exercise with caution - as a puppy, Bloodhounds will tire quickly. The Bloodhound is not particularly adept at advanced obedience work, but they should be trained in basic obedience. The Bloodhound is a scent hound, and as such "the nose rules" and so they will put their nose down and become oblivious to all around them and will follow the scent until its conclusion. This means they have no road sense and should only be allowed to run free in a secured area. The Bloodhound has very few medical problems, but can be prone to bloat which is a serious condition and requires immediate veterinarian attention. The eyes also need to be checked and well cared for. A Bloodhound needs to be part of the family and involved with the family and if included they will make excellent companions.